We are grateful to Alan Perry, one of Forbes Perry’s sons, for kindly providing this obituary. 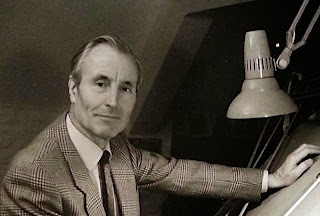 John Mortimer’s close association with the inventor of the Perbury infinitely variable transmission began when Mortimer was editor of The Engineer in the 1960s. Forbes was born in London in 1923, his father George being a distinguished military and civil engineer who had worked on the Aswan Dam. Despite the fact that George died suddenly from an unresolved First World War wound when Forbes was only 12, the son inherited his father’s love of engineering in all its myriad forms. Educated at Charterhouse, Forbes left school in 1941 to be immediately immersed in the war effort, spending the next five years in the RAF. Grounded by chronic air-sickness he spent much of that period working with damaged aeroplanes and honing up his engineering skills: as a result, when in 1946 Forbes went up to Sidney Sussex College, Cambridge, to do his delayed engineering degree, he discovered that he was already ahead of the game and the degree course would mean little more than marking time. So he opted instead for a four year training course in aeronautical design with De Havilland and which included work on Britain’s first passenger jet, the short-lived Comet. Qualifying in 1951, Forbes worked initially for Tiltman Langley Ltd. then Mullard Research Laboratories in Surrey. But while his career in aeronautics was progressing, Forbes had already found another specialist area of engineering that was to absorb him for the rest of his life. Watching cars competing in an off-road rally “with their revs all over the place”, Forbes was intrigued by the possibility of developing a gearbox without any gears, an infinitely variable ratio transmission (IVT) that would mean optimum torque and power coupled with maximum economy at all times. He discovered that initial research had been made into this in the 1930’s by an American, Frank Hayes, who had put such a gearbox into production with Austin cars in the UK; but his design had been faulty and the project failed with only a handful of cars ever sold. Forbes managed to obtain several scrapped Hayes transmissions and, working in his spare time from a garden shed at his house in Felbridge, Surrey, resolved to perfect a new toroidal design and get an IVT working in a road car. This back-breaking work absorbed him for the best part of five years but his eureka moment came in 1956 when the technical problems had been overcome and the new IVT was running successfully in a Hillman Minx. It was at this stage that, with the backing of private friends, Perbury Engineering Ltd. was founded and Forbes resigned from Mullards to concentrate full-time on the new business. However, although the technical problems had now been resolved, the commercial ones had only just begun. Despite interest in the concept from many quarters and Forbes driving 25,000 miles to demonstrate the Perbury-equipped Hillman to 51 different companies, no commercial takers emerged. economy was not an issue and if you wanted more power you just bought a bigger engine. But the situation changed in the 1960’s when the British Government started to take an interest. In 1967, the National Research and Development Council (NRDC) agreed to a partnership under which NRDC would fund design and project development work on a revenue-sharing basis with Perbury. The first major fruit of this collaboration was the development and production of a constant speed alternator drive for the Harrier Jump Jet. In the 1970s, working jointly with British Leyland, the Perbury IVT was trialled in a Triumph passenger car, and in the early 1980’s a prototype Perbury-Sierra was produced in collaboration with Ford Motor Company. But the relationship with NRDC ended shortly after, following a series of disagreements over patent rights during which NRDC tried unsuccessfully to prevent Perbury Ltd. from continuing on its own. Instead, NRDC set up its own subsidiary, Torotrak Ltd., to pursue independent development of the Perbury technology. This created not only a great personal disappointment but a major setback from which Perbury’s commercial ambitions never fully recovered. Forbes continued to plough his own furrow and the IVT technology was subsequently adapted for vehicles as diverse as quad-bikes, sit-on lawnmowers, buses and heavy goods vehicles. In the 1990s, Forbes also worked as a consultant with several Formula 1 teams to produce active differential systems for racing cars, as well as with manufacturers of lightweight, electrical and hybrid cars. This tireless development continues to this day in partnership with various innovative companies worldwide, with Forbes personally at the helm until the last. Forbes died peacefully but suddenly in his sleep on Friday 20th December, aged 90, as a result of a ruptured abdominal aneurysm. Hopefully he will be an inspiration to many a budding engineer. Always a deeply spiritual man, throughout his life he pursued an eclectic search that took him through many differing philosophies and spiritual traditions of both East and West. His particular interest was the dialogue between science and religion and in the 1960’s and 70’s, he was active in the theosophical Science Research Group, both as a lecturer and contributing to its influential book ‘Intelligence Came First’. Later, in more meditative mode, he savoured the stillness of Quakerism in his local village. Forbes was always known as a quietly-spoken and unassuming family man who eschewed personal publicity. He was also a long-standing vegetarian and his favourite recreation was tending the large vegetable garden at his home in Charlbury, Oxfordshire. As a keen golfer he was able to maintain a weekly nine holes, even into his final year. Forbes was married twice; first to Gabrielle in 1949 with whom he had four children; the marriage dissolved after 30 years. Forbes then re-married to Patricia who survives him. I am saddened to hear of Forbes’ passing. I worked with Forbes briefly in the early 2000’s- he was a good person and engineer.